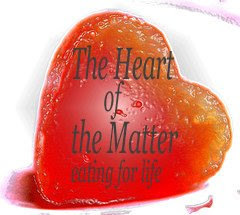 Grains were the subject of this month's Heart of the Matter ... and here you'll find a small number of very good ideas from some of the best bloggers around. Cooking wholegrains always seems tricky to me: there's that whiff of 70s sandal-wearing earnest hippie-dom which is hard to shake off - boring brown food that tastes like horsefeed. Not these days. The 21st century way with wholegrains is altogether tastier, somehow less earnest. I've been experimenting with the help of a highly recommended book, A Cook's Guide to Grains by Jenni Muir. Now I'm planning to add these dishes to my staple repertoire - these are all easily achievable, mostly quite quick, all of them the kind of recipes you can fiddle with to add your own stamp. Labelga's quinoa flakes with spinach and red chilli is ready in 10 minutes, so there are no excuses for not giving this a go. It's one of Labelga's AAP dishes - another alternative to pizza! As you can see from the picture, the flakes are spread onto the plate, then topped with this fabulous spiced mixture. Find it at Leafy Cooking. Christine at Kits Chow made vegetarian multigrain rice with vegetables, inspired by a Japanese rice dish, matsutake gohan (rice with mushrooms). 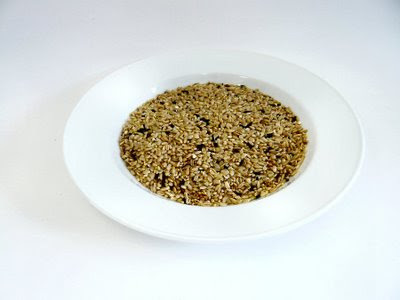 This is something to get you experimenting - there are five grains: brown rice, black glutinous rice, buckwheat groats, oat groats and millet. Bee and Jai have been doing some hard thinking about what they buy, cook and eat. 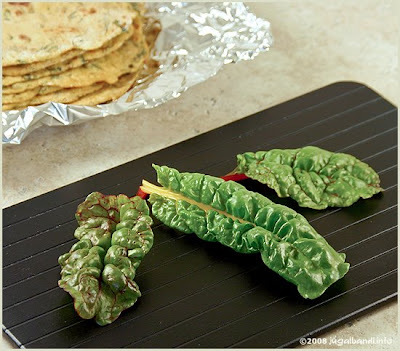 Their post for Heart of the Matter is interesting and inspirational - they share their personal "rules", and finish with a versatile recipe for roti: this one is sourdough Swiss chard and cornmeal. You'll find it at Jugalbandi, always a good read. 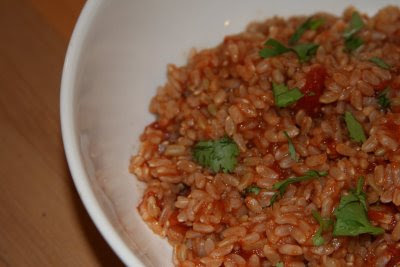 I often think of cooking wholegrains as time-consuming, but here's another recipe that shows that wholegrains can be quick and easy. Michelle The Accidental Scientist, one of my co-hosts for HotM, makes this Mexican style rice when she's short of time, as an accompaniment to fish, tacos, beans - lots of links to these and other recipes. 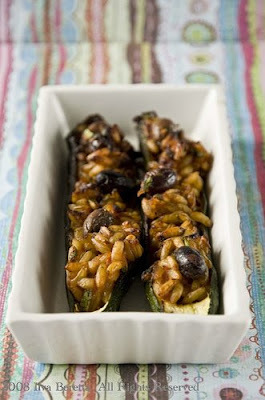 Co-host Ilva at Lucullian Delights has stuffed courgettes with kamut grains which she found when out shopping a little while ago. As always with Ilva's food, it's beautiful and packed with flavours: she calls her dish oven baked zucchini filled with kamut, olives, thyme and parsley. Chop an onion and gently fry in a biggish saucepan, in a good glug of olive oil. Rough chop around four heads of spinach, I often also add sorrel, baby nettles and cleavers, depending on what's growing, and add to the pan, cover and let sweat for five minutes. Next add 250gms of brown rice, 600ml of water and juice of a lemon. Bring to the boil, season,cover and turn the heat down. Check after about 20 minutes, stir, add water as needed and so on until cooked (usually around 50 minutes)you might also want to add at this point a good few fistfuls of herbs such as mint, parsley, celery leaves, dill. When cooked it has the consistency of risotto and is a beautiful emerald green. Be more or less heart healthy with a grating of cheese on top. Nearly forgot: I blogged two grain dishes at Joanna's Food - Skirlie, a cheap and cheerful Scots dish made with oats, and these great six-seeded rolls. Another inspirational round, and very nice, the extra recipe, thanks, Joanna!